This paper presents a new disposable electrochemical biosensor for the analysis of Haptoglobin (Hp) which shows many important functionalities such as antioxidant capabilities, antiinflammatory activities and regulation of the immune system. Aminopropyltriethoxysilane (APTES) was self-assembled onto an indium tin oxide (ITO) substrate to fabricate a disposable biosensor. Anti- Hp antibodies were immobilized onto the modified ITO surface covalently. The optimization of the construction parameters and the analytical performance of the biosensor were examined and compared. The methods, cyclic voltammetry (CV), electrochemical impedance spectroscopy (EIS), and scanning electron microscopy (EIS) were operated for detailed characterization of the different surfaces of the biosensor. Kramers-Kronig Transform was also applied to raw EIS data for checking the verification of obtained experimental EIS data. 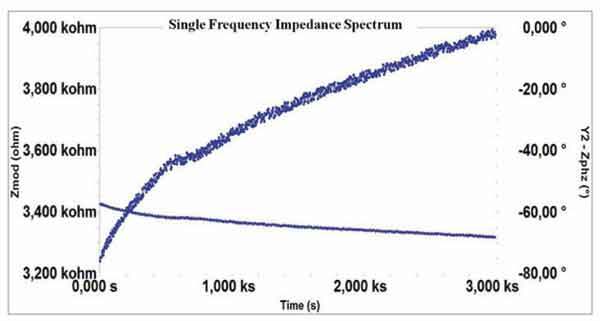 Moreover, a useful method, single frequency impedance (SFI), was successfully operated to characterize the binding of Hp to the electrode surface modified with anti-Hp. At last, the presented biosensor was applied to the analysis of artificial serum samples, which were spiked with Hp. Haptoglobin, indium tin oxide, biosensor, acute phase protein, electrochemical impedance spectroscopy, single frequency impedance. Namık Kemal University, Faculty of Science, Chemistry Department, Biochemistry Division, Tekirda , Turkey.